Terrapin Mountain is located on the eastern edge of Jefferson National Forest near Lynchburg. West and north of Terrapin Mountain is the Blue Ridge Parkway and Thunder Ridge Wilderness. Because of the Blue Ridge Parkway, Terrapin Mountain seems cut off from the rest of the National Forest. There is no direct access to Terrapin Mountain from the Parkway. The only current trail map for the area south of the James River Face Wilderness is the National Geographic/Trails Illustrated map (Link). This map is getting a little old - copyright 2007, and it shows the Terrapin Mountain Trail as a simple out-and-back. Not interesting enough to make the trip from Charlottesville. 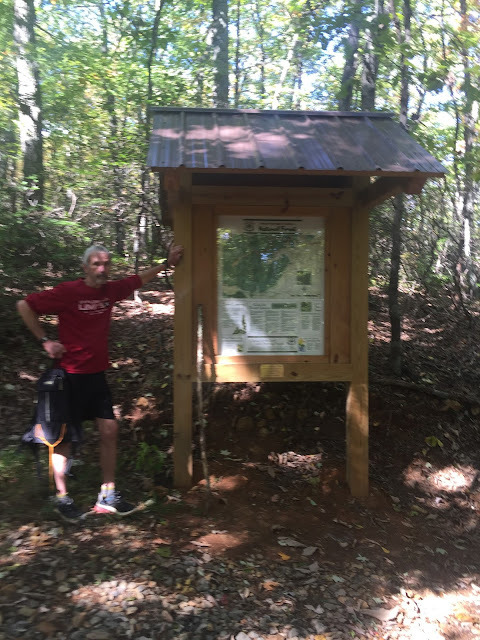 But when my friend Dave from the Roanoke Appalachian Trail Club announced an RATC group hike he called the "Terrapin Mt - Reeds Creek Loop," I was on board. Dave lives nearby and knows these mountains really well, so I figured that he could take us on an interesting journey, even if it meant some bushwacking. No bushwacking necessary, though! There is a nice loop hike here on established trails and closed forest roads - the route just isn't found on the Trails Illustrated map. This hike definitely falls within the blog's mission to uncover Virginia hikes not found anywhere else. Hardly anybody knows about this loop, and I couldn't find anything about it online. [Note: this hike has since shown up on a local trail site.] In order to complete this hike, I needed a local to show me the way. Here is a topo of the route (loads slow): Link. This is your best map option if you want to try this hike. The loop itself is in good shape; well maintained with only a couple of "scratch your head, wonder where you go next" points - those points are described and explained below. Tough morning for one driver I passed on my way to the trailhead. This was at the intersection of U.S. 501 and Va Rt. 122. To get to the trailhead from Charlottesville, take U.S. 29 south past Amherst onto the Lynchburg Bypass, then exit at Rt. 130. Take Rt. 130 west about 20 miles to the Blue Ridge Parkway. Take the BRP south over the James River and get off at the U.S. 501 exit just after the river. Take a right on 501, south towards Big Island. You travel on 501 for only a couple of minutes (just like the BRP) before taking a right on Va 122. Pass by the sign for Big Island Elementary School after a couple of miles, then turn onto Rt. 814 at the white Tabernacle Church of God. Follow 814 until it ends at the trailhead. There was just enough room for our group's 4 vehicles. Terrapin Mountain from the road. Blurry photo shows what the parking area looks like. It is just behind the "End Road Maintenance" sign. with a map of the area. Kiosk is just off of the parking area. The trail starts out as an old woods road, passing a brand new kiosk with a Forest Service map of the area, which makes me think that the Forest Service is encouraging more recreational use for the area. A local Eagle Scout constructed the kiosk as his service project. At the 0.4 mile mark is a new trail sign. The loop ends here. You should go straight, towards the summit. This trail is steep here, ascending nearly a thousand feet in the first mile. The first portion of the trail can be rugged and steep. Near the one mile mark is a confusing spot. The trail appears to come to a T intersection, and both to the right and to the left the trail seems to become overgrown pretty quickly. Neither option looks correct because, actually, neither one is. You go to the left, but after about 10 feet you head back uphill. This isn't obvious until you head to the left. Our entire group got a little turned around here, as folks rooted around for the correct route. My GPS told me where to go. After climbing a little further past this point, the trail levels off for a while and rides the mountain at about the same elevation before switchbacking and climbing some more. At 1.4 miles a rocky spot on the right provides this wonderful view. Blue Ridge Parkway, Appalachian Trail, and James River Face Wilderness. From here, you can make out the Blue Ridge Parkway as you gaze west and north at the Thunder Ridge Wilderness and James River Face Wilderness. I could have stayed here all day! Blue Ridge Parkway faintly visible on the mountain in back. After that, there are a couple of false summits before the ridge top trail reaches the real summit of Terrapin Mountain at the 2.8 mile mark after a 2250 foot elevation gain. Beautiful autumn colors on the mountain. The trail can drop fast at times. Just past the summit, the trail cuts to the right (another "not quite sure" moment) before opening up to another rock providing a view west. just after the summit of Terrapin Mountain. The trail continues to drop, passing a strangely located and poorly positioned trail sign. You would think that the trail goes to the left or right at the sign, but no. It keeps going straight. This sign makes you think the trail turns here, but it goes straight. It wasn't going to swivel into position, though Dave did try! At about the 3.5 mile mark, the trail comes out at a road and a small field. This is called "Camping Gap," and that road is open all the way to the valley. The road is also a portion of the Glenwood Horse Trail, a 60+ mile route that uses trails and woods roads to wind throughout this part of the National Forest. We could have followed this road to the right about a mile to find the Hunting Creek Trail, which would take us to the Appalachian Trail near the Thunder Ridge Wilderness. The trail meets a forest road at Camping Gap. Follow the road to the left for 200 yards to continue on the trail. Instead, we took a left on the road, followed it about a hundred yards, and dropped down on the continuation of the Terrapin Mountain Trail at a point marked by a sign. The others were ready to continue down the trail. The trail then follows a series of old woods roads that gradually drops in elevation until reaching a crossing at Reed Creek at the 5 mile mark. The portion of the loop between the Glenwood Horse Trail and the Reed Creek Crossing is not shown on the Trails Illustrated map. But it is a nice, gradual trail; easy to hike except for moving on a lot of fist sized rocks. Stream crossing about half way through the hike. The Reed Creek crossing is really only a little over half way on this hike, but because all of the excitement is over so it seems like later in the journey. The trail crosses back over Reed Creek a mile later, then follows an old woods road (labeled FR 3009 on the Trails Illustrated map) for 3.4 flat miles along the edge of the National Forest boundary before reconnecting with the original trail 0.4 miles from the parking area. No views, but a pleasant walk through the forest. This entire loop is part of a trail run known as the Terrapin 50K, which is run in March. (Map.) One member of our hiking group, Steve, is a trail runner who has run this race. I am told that the race route goes left at the summit, missing the steep downhill before the second overlook but going instead through a very tight space between two rocks called the "fat man's misery" (Link). Personally, I'll take the overlook, but you can decide for yourself. The RATC hiking group in general broke into a fast group and a slow group, and I did my best to keep up with the speedier hikers, despite a desire to stop and take photos. I think the slow group struggled, as the first three miles of this hike is a demanding climb. Keep that in mind if scheduling this hike. I liked the challenge, and hope to return here during another season to try the loop again. Total Time: 4 hours, 38 minutes, including stops. Steepest Uphill: from 0.3 miles to 0.9 miles; 23.2% average grade. Total Altitude Gain: 3464 ft.